Several things happen during a angelic reiki session. Initially, you'll have a few minutes to talk with your angelic Reiki practitioner to discuss any concerns, questions or medical complaints you may have. (although Reiki is NOT a replacement for medical care, you should always let the practitioner know of any medical issues or treatments you're undergoing). to enhance the relaxing and healing ambiance of your treatment angelic reiki Music will play softly in the background, lights may be dimmed and candles/incense may burn contributing to the overall state of tranquility and relaxation. Please let your practitioner know if any of that is uncomfortable for you and they can be omitted. The Reiki treatment itself consists of being comfortably seated or lying on a massage table fully clothed while the practitioner places their hands gently on your shoulders . 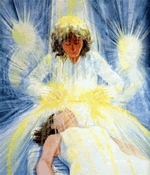 Once the angelic reiki practitioner begins to channel the beautiful energy from the angels directly to you you may feel warmth, tingling, pulsating, have a emotional release or you may see signs or symbols or even visions , you may not sense anything at all but a feeling of being very relaxed peaceful and supported by the angelic kingdom, during a angelic reiki treatment the healer becomes a clear channel and connects to the angelic kingdom and other healing beings of a 100% light. A lot of clients worry about having a emotional release during a treatment, you may not know why you wish to cry, crying is a great release and is part of the healing process there is no need to hold it in you will be in a safe supported space so go ahead and let it go!, you may also feel tearful from the wonderful loving energy that comes through from the angels this is often the case with angelic reiki. As Angelic Reiki connects with your energy it can bring about deep healing to the very core of your soul. Many illnesses are caused by our energy becoming unbalanced or blocked, these imbalances can be caused by suppressed emotions, out dated belief systems or negative thought patterns. You may also be suffering from fears or traumas relating to past experiences or even past life experiences, often we are not aware of the cause of the upset. This wonderful healing experience connects you to the higher realms and brings you closer to the divine energy. At the end of the angelic Reiki session the practitioner will softly whisper you name and place a hand on your shoulder to let you know that your treatment is complete and that you may take a few moments to get up. There is no need to jolt from the position you're in. Take a moment to enjoy the pleasant effects of Reiki energy before rising . You will be offered water at the end of your session, once you've regained an upright position. it is always advisable to drink plenty of water Drinking water assists the body in flushing the toxins that have been broken down for release it also assist the integration of the healing energies. It is recommended that you drink fluids (water / herbal tea) after receiving Angelic Reiki or any other form of healing to assist the body and the energies. After you have received Angelic Reiki you may feel very relaxed and experience deep feelings of peace, so I recommend being kind to yourself for the rest of the day.